Designing for social impact and good causes is an important part of the Allotment’s work so we were thrilled to be approached by The Big Lottery Fund to help them manage their interaction with the voluntary sector. The Big Lottery Fund is the largest distributor of the good cause funding raised by the National Lottery and it distributes over £700 million a year to incredibly worthy causes. In order to maintain the awareness of the ‘good’ that the National Lottery and the Big Lottery Fund does it is vital that all grant holders, regardless of size or the nature of their project, publicly acknowledge the grant they receive. To help them comply with this condition The Allotment were asked to design a Grant acknowledgment booklet as well as a Guide to publicity, which is provided to all projects when they get their grant offer and contract. 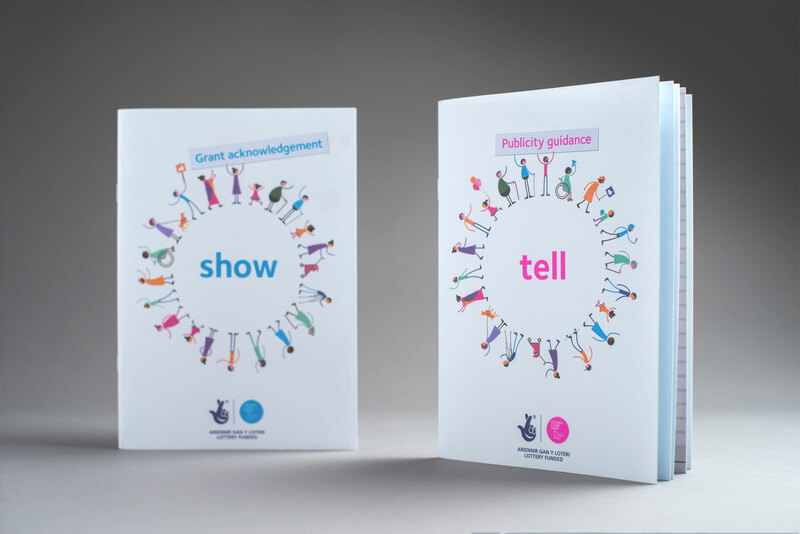 The colourful booklets use the thought of 'Show' for the logo usage guidance and 'Tell' for the guidance to generating publicity. The booklets needed to be approachable, accessible and be very clear about the guidelines for logo. They also needed to be adaptable to allow for a Welsh translation. The end result is a set of documents that have an uplifting, celebratory feel which take an encouraging and caring approach to the voluntary groups that work so hard to win Lottery Funding.